← Making Music with Muscles! Wow – like many people in the world, I was glued to the monitor watching Red Bull’s Stratos project as Felix Baumgartner took a record-breaking jump from more than 24 miles above the Earth! Sponsorships and events have been taken to a new high (no pun intended)! On October 14, Baumgartner, an Austrian skydiver and daredevil, made history’s highest and fastest jump. After ascending to more than 128,000 feet in capsule tethered to a helium balloon, Baumgartner jumped and became the first human to break the sound barrier as he fell at a rate of 833 miles per hour and had a free-fall of more than 4 minutes! I’ve watched the video a dozen times, each time with my mouth falling open in admiration and disbelief at the feat. The event was sponsored and funded by Red Bull – a company known for pushing the envelope of crazy and risky sports. The company doesn’t consider this a stunt though, preferring to characterize the program as a professional flight test program. Red Bull spent more than five years on the project with an expert staff of scientists, engineers, and physicians – many of whom had experience with NASA programs. The cost to Red Bull has not been disclosed, but estimates on the return to the company in regards to visibility, branding, and goodwill tops $8 billion. If you haven’t viewed the video yet, you watch it now. By the way, the view estimates on YouTube and the Red Bull site exceeded 50 million in the first 48-hours, setting another new record for viral videos. Once again, wow. 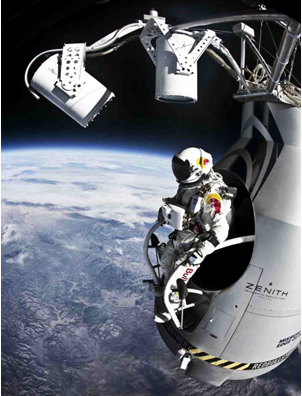 Well done to Mr. Baumgartner and the Red Bull Stratos team! 1. Discuss with students the value of sponsorships. Why do companies sponsor events – oftentimes events that seem to have little to do with the products? What do companies gain? What do they risk? 4. Divide students into teams: Have them discuss how this fits into Red Bull’s branding and messages. Describe Red Bull’s target market. 5. Have teams choose a company and develop an outrageous sponsorship or stunt. What would the goal be? How does the stunt tie into the company’s brand?